As this report wings it’s way to the Worshipful Company the Squadron are on their second Annual Training Exercise (ATX), based with 42 Engineer Regiment at RAF Wyton. This ATX has focussed on the underlying technical skills required for the Squadron to take on one of their unique roles within the Army – the Bulk Reproduction of 100’s of maps. We have had parts of the Squadron doing driver training to get the vehicles where the maps will be needed, whilst others have been writing the new Standard Operating Procedures (SOPs) – down to where best to stand to gain the extra 30 maps per hour. The new Officer Commanding (OC), Major Mark Sleeman, has been in post since the beginning of September and so the ATX has provided a useful opportunity for him to get to know more of the individuals of the Squadron. One of the informal Squadron cohesion events was to head out of camp for a few hours of Clay Pigeon shooting, which provided some healthy competitive spirit. Working in close proximity to our Regimental Headquarters has also provided the opportunity to forge links with those individuals we might not ordinarily get to meet from the wider Geospatial community. The Regiment also took the opportunity to bid a fond farewell to the outgoing OC, Major Neal Archer, who has had an illustrious 27 year career with the Squadron. We wish you all the best Neal. The Squadron visited Amiens, St Quentin, and Mons, following the final stages of the War in 1918, in particular, the German offensive and the successful allied counter attacks leading to the withdrawal of the German Army. 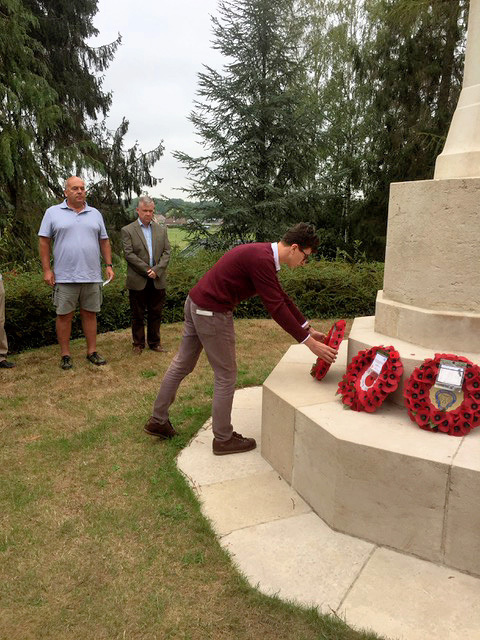 We took the opportunity of a warm summer to pay our respects to those that had fallen at Mons, and who were buried at the St Symphorien cemetery, and who were the first and the last to fall on the Western Front. For our enduring task to the Army Readiness Order in support of the Allied Rapid Reaction Corp (ARRC), we deployed on the ARRC’s exercise in Devon. This was a perfect opportunity to test the capability of our new equipment and for the Squadron to gain our annual assurance of role. As a follow on we conducted bulk replication training at Ewell using our brand new bespoke containers mounted on 15t MAN trucks, to test out their capability and conduct initial familiarisation training. Sometimes in the Geo Engineers we forget that we are part of a wider Engineer family and so this was a great opportunity for the Squadron to meet at the home of the Royal Engineers at Brompton Barracks, with the associated history that 300 years of the Corp have to offer. The visit included a tour of the Royal Engineers Museum, with a focus on the Royal Engineer’s significant contribution to early British Military Aviation and then a Squadron Parade at the Barracks itself. Promoting excellence is always rewarding and this award provides the Worshipful Company and the Squadron the opportunity to jointly congratulate an outstanding member of the Squadron. The dinner itself is an alumni event and so allows those that have previously served with the Squadron to catch up with their old friends and to make new ones. 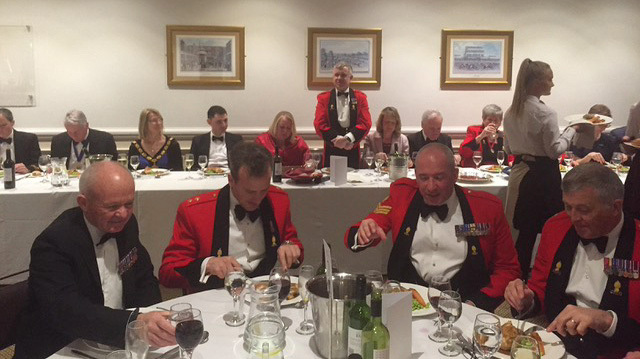 The dinner was a huge success and we look forward to welcoming the new Master to the Remembrance weekend for the announcement of the new Endeavour Award winner. 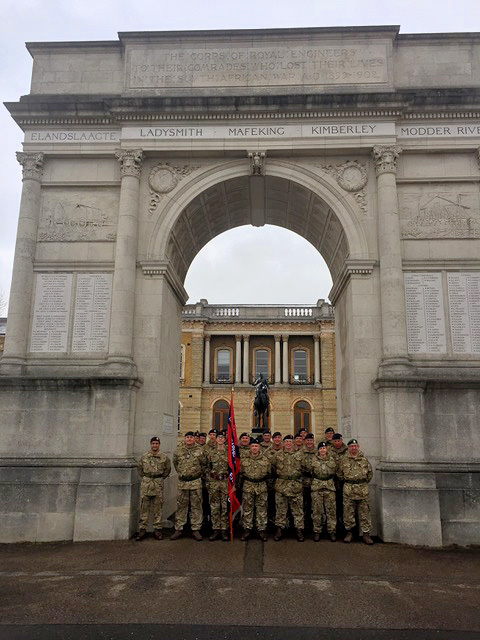 The Squadron’s training program for the rest of the year focuses back onto soldiering skills and then the Lord Mayors Show and Remembrance parade. Into the new year we see various technical courses running to get our soldiers Geo qualified. We wish those members of the Worshipful Company going to Snowdonia an enjoyable trip with Nessy! During her most recent visit to Tunisia, ECHO participated in a number of events promoting National Women’s day. 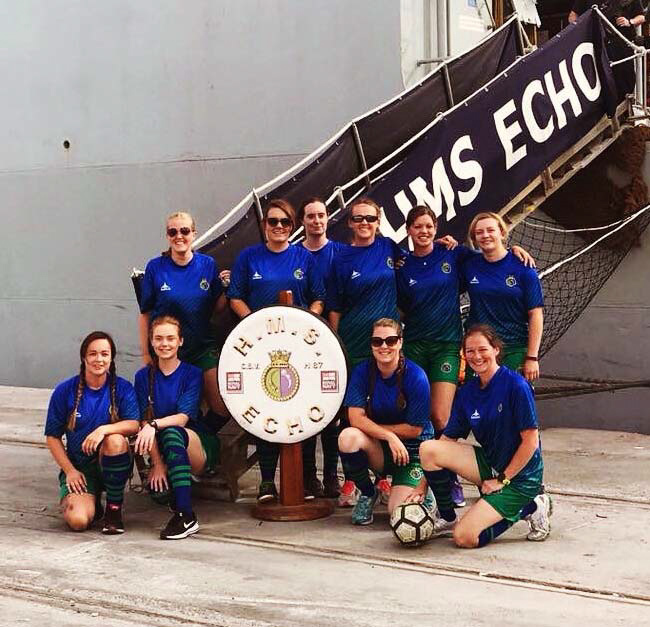 These included a gender discussion, a ship’s tour and a debut appearance of ECHO’s female football team. Great fun was had by all. The 60 minute match in the Tunisian heat saw the ladies narrowly defeated in a competitive game. Despite the score line the ladies enjoyed the match and are looking forward to their next fixture. The main focus of ECHO’s effort throughout September was dedicated to the NATO maritime security operation – Operation Sea Guardian. The aim – to deter and counter terrorism and help build situational awareness in the Mediterranean. For ECHO this meant a preparatory briefing visit into the Italian Naval Base, Taranto, to meet with our partners from the Italian Ship ESPERO and the Croatian Ship VUKOVAR. The opportunity to avenge England’s recent World Cup loss to Croatia was presented in a football tournament between the three ships. ECHO’s team did not disappoint, as they gained an emphatic win against the Croatians, followed by a thrilling, close-fought 6–5 defeat to the Italians in the final. After operational planning meetings were held, ECHO sailed from Taranto as part of a task group before spending a busy day and night of exercises, including close formation manoeuvring, simulated threats from fast attack craft, as well as communications exercises in preparation for the upcoming operation. ECHO then headed to the Southern Mediterranean where she spent time conducting security patrols; this included reporting on merchant traffic in the area, speaking to merchant seafarers, and reporting suspicious activity. A busy and worthwhile period at sea concluded back in the Gulf of Taranto where the ship met with the ESPERO and VUKOVAR, and concluded the operation with a media day based around a boarding scenario during which ECHO acted as the suspect merchant vessel, and was subsequently boarded by teams from both seaboat helicopter fast-roping. The next few months for ECHO will remain busy and varied; as we go to press a survey of Gibraltar’s harbour using Survey Motor Boat SAPPHIRE is getting underway. Looking a little further ahead, in addition to some surveying, ECHO has a number of defence engagement commitments. 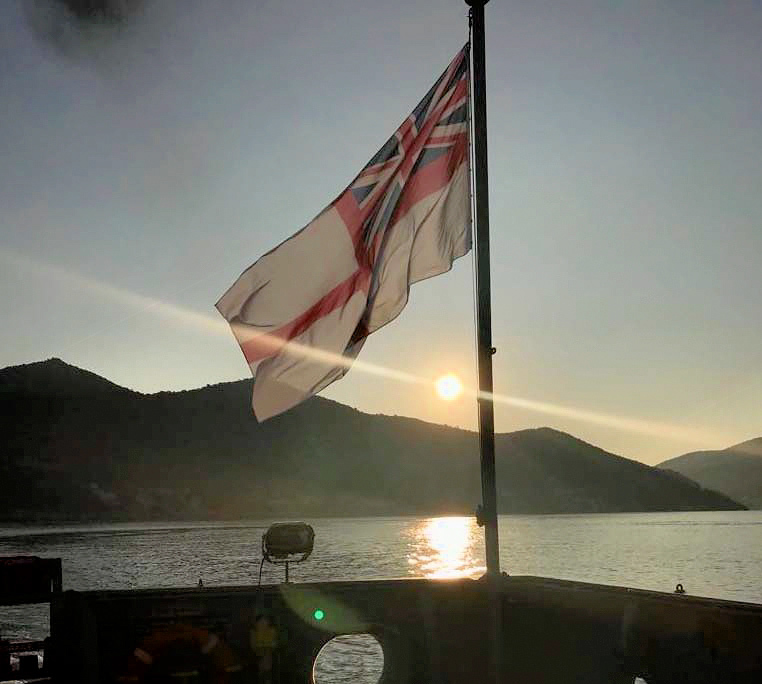 A period of deployed Operational Sea Training and a maintenance period are additional elements that will ensure the ship remains ready to fulfil commitments over the remainder of her deployment. Two members of the Sqn are currently mobilised in support of Op SHADER (the UK contribution to the ongoing coalition intervention against so-called Islamic State). The Sqn’s primary focus continues to be the provision of intelligence analysis in support of operations and the augmentation of Regular RAF teams at RAF Wyton. We have four teams, each focused on different intelligence tasks involving the analysis of imagery. One team is currently trialling a rotating attendance pattern so that we can now provide support over two weekends per month. 16 members of the Sqn are currently enrolled on the Operational Air Intelligence Course (Reserves) (OPAIC (R)). Successful completion enables participants to work as generalist Intelligence Analysts prior to completion of imagery specific training. Sqn members have completed the Polarmetric Imagery course at RAF Wyton and the Space Operations Foundation Course. We have 13 personnel undergoing Basic Recruit Training at RAF Halton. One member (me) completed the Pathfinder March in Jul, a 46-mile route around locations of former RAF Pathfinder Force stations which must be completed within 20 hours. One Member won her colours for RAF Rowing. As members of the RAF Sailing Association, two Sqn members have provided safety team cover to the RYA Sailability programme and competitions held at Rutland Water. One member took part in the UK Armed Forces and RAF Middle Distance Championships at the Vitruvian, where she came a credible 9th place in her age group. She also won a trophy for being the first RAF female and another trophy for RAF Novice Female in the RAF Triathlon Team. Three members designed and managed a competition stand at this year’s Altcar Challenge military skills competition. This event is primarily focused on Army Reserve units and tests infantry skills. 7010’s input required competitors to match imagery against map references in order to locate and recover components of a mock reconnaissance pod (see below) 1 and then re-assemble it against the clock. 7010 Sqn was the only RAF Reserve unit supporting this competition. One member ran the Spitfire 10 Km run at RAF Cosford for the RAF 100 Appeal. Four members of the Sqn participated in the RAF100 Parade in London on the 10 Jul 18. All spent the preceding week undergoing intensive drill and parade practice at RAF Halton, not the most pleasant experience given this Summer’s weather!